BE inspired. BE creative. BE happy. I think it’s not only possible to be both creative and happy, but I believe being in a place of happiness, self-acceptance and gratitude in fact allows us to be more creative, to stretch our imagination, and really be in tune with the divine source of expression and inspiration from which creative ideas come. Creativity is part of who we are at our deepest level, and when we access it, we reveal a piece of our self to the world. This opens us up to being vulnerable and requires courage and strength. Rejection and criticism are a part of the process, so being authentic and giving a part of yourself absolutely requires a certain fortitude of character and core that can be strengthened like any muscle. And while I will delve more deeply into methods that keep me motivated and inspired, grounded yet open, and yes, even happy while living a creative life, one of my own intentions for this year is to be happier. And for me that requires a lot of self-love. The difference is the path I chose has a heart; the one that led to law school was just the next logical step along a much worn path. Following your bliss can definitely be hard. There is no ‘logical path’ to becoming a songwriter. And often the most challenging aspect of choosing an unconventional path and staying on it is keeping the lines of communication to that little voice inside that is uniquely and solely your own, open. And then when you hear it, not to judge or quash its expression. For me, every time I see someone who has succeeded in following his or her own unique path, it gives my own voice a little more volume and courage to keep singing its song. The “TODAY” show recently interviewed Sara Blakely, creator of Spanx. Blakely became the world's youngest self-made female billionaire, an empire she started with $5,000 in savings. However, Brand Channel reports she admits this wasn’t her original plan. She planned to be a lawyer but failed the LSAT. Where would we be without those thigh slimming, belly flattening undergarments? I, and millions of women (and our hips!) am so thankful that Blakely followed her instincts. She may have had a little divine intervention on her path in that she actually failed the LSAT, as if the Universe was telling her there was something else it had planned for her. And luckily, she listened. A brilliant, creative, much-needed idea that may have never come to light had she just kept taking the LSATs and headed off to law school to be yet, another lawyer. I have an extremely over-active mind and my inner critic is alive and well. So in order to silence those negative voices that tell me Faith Hill may never sing one of my songs, I have to remind myself each day of how far I’ve come on a journey that is uniquely my own. And each day I take another step motivated from my heart, and listen to that small voice that whispers, ‘yes, you are on the right path even if you don’t know where it’s headed,’ I feel a little happier. So just for today, take a minute and remind yourself of one accomplishment, one small thing you did that made you feel a little happier, that was motivated from your true nature. The canvas you bought that still sits blank, but you are one step closer to picking up the brushes; or the new fountain pen begging to be your magic wand and inscribe the memoir buried deep in your chest. Think of just one small thing you’ve done for yourself that has moved you just a little further along your right path. Then smile, and congratulate yourself. Because being true to yourself is where both happiness and creativity are born. This post also appears at Nashville.com. 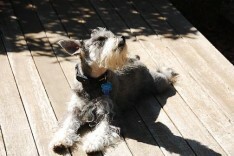 A Note of Thanks: Inspiration for today’s Blog comes from Elizabeth Gilbert’s TED talk: http://www.youtube.com/watch?v=86x-u-tz0MA, P!nk’s song F**ckin’ Perfect, and my sun-chasing dog, Wolfgang.